All of these facts may make it sound as though scientists know a lot about Fast Radio Bursts. In reality, we don't. For instance, though we know they're not from our galaxy, we don't know where exactly they come from. We don't know what causes them. And we're not sure whether they might be useful as cosmological standards to measure the large scale properties of our universe. Fast Radio Bursts involve types of neutron stars, such as pulsars (which rotate rapidly) or magnetars (which are highly magnetised). These are probably the most plausible theories, since neutron stars' intrinsic and extremely large magnetic fields can naturally fulfil the energy requirements for Fast Radio Bursts. And then there's the suggestion that Fast Radio Bursts are evidence of aliens. It's certainly the most unusual of the proposed theories, but it cannot be ruled out as a possibility yet. Although it's unlikely, Fast Radio Bursts may be signals from a beacon set up by an extraterrestrial civilisation, or perhaps from light sails that harness photons to travel across the galaxy. There's a remarkable variation in these models, and it's hard work to narrow down the options and reach consensus. Of the 50 theories or models proposed to date, only three have been eliminated. This is what prompted us to set up the catalogue and to invite engagement from the broader scientific community. It's no easy task to get scientists talking to each other about Fast Radio Bursts. That's because the scientists in question have different specialisations and are from all over the world. 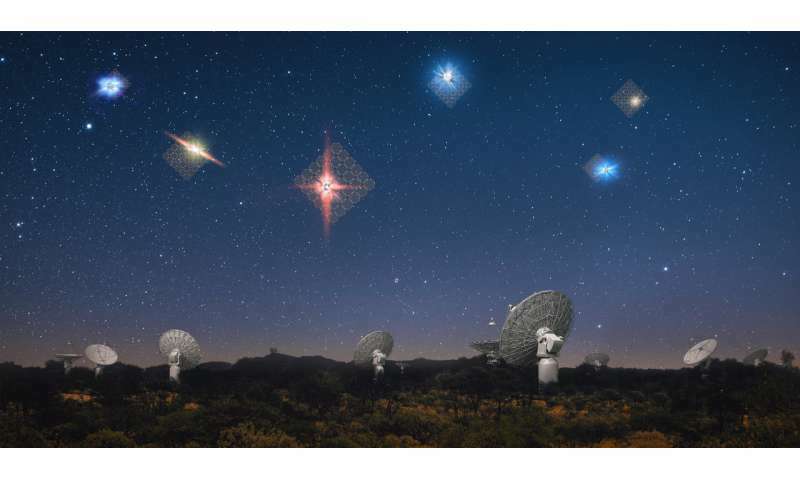 Data about Fast Radio Bursts is starting to pour in now, thanks to such game-changers as MeerKAT and HIRAX. As it arrives, is examined and papers are published, we'll be able to start ruling out theories and digging deeper into viable theories. Within five years, this mystery could be solved. My hypothesis/interpretation: I believe there is black hole's credit here. There may be more than one path for FRB to travel the Earth. For example, through a straight line (geode in geometry), but not thru a black hole to reach the earth directly. And for example, through a black hole. It's possible to also pass through several black holes or a black hole several times. Thus they are the same FRB, but due to the complex geometric topology of the universe, the delay of arrival time in different paths are generated.